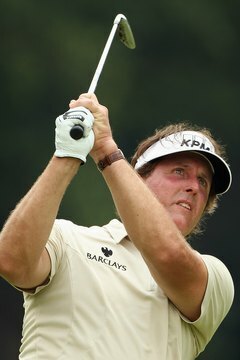 Though less common, left-handed players like Phil Mickelson have had success on tour. Things are sometimes more difficult for left-handers. Most golf shops have lots of equipment choices for righties, but few if any clubs for lefties. And golf instructions are mostly written from the perspective of a right-handed person. Holding a golf club is the same for a left-handed golfer, except that the dominant and non-dominant hands are reversed. Grasp the club in the fingers of your right hand as you stand over the ball. Wrap your fingers around the club so that "V" formed by your thumb and forefinger point to your left shoulder. Your thumb should point down the grip, just to the left of center. Position your hand at least a quarter-inch from the top of the grip. Place the small finger of your left hand in the gap between the middle finger and forefinger of your right hand. Wrap the rest of your fingers around the handle of the club and below your right hand. The "V" formed by the thumb and forefinger of your left hand should point to your left shoulder. This is called the overlapping grip. Position your right hand as in Step 1. Slip the forefinger of your right hand between the little and ring fingers of your left hand. Wrap the rest of the fingers of your left hand around the handle of the club and below your right hand. The "V" formed by the thumb and forefinger of your left hand should point to your left shoulder. This is called the interlocking grip. Place your right hand as in Step 1. Put your left hand directly underneath the right hand so the little finger touches the forefinger of your right hand. Wrap all 10 fingers around the handle with the "V" formed by the thumb and forefinger of your left hand pointing to your right shoulder. This is called the 10-finger, or baseball, grip. Steve Silverman is an award-winning writer, covering sports since 1980. Silverman authored The Minnesota Vikings: The Good, The Bad and The Ugly and Who's Better, Who's Best in Football -- The Top 60 Players of All-Time, among others, and placed in the Pro Football Writers of America awards three times. Silverman holds a Master of Science in journalism from the Medill School of Journalism.